Common farming activities can sometimes pose a threat to ancient and veteran trees. Compaction, for example from farm machinery or from trampling by people or livestock) causes serious harm to roots, as it squeezes the air-spaces out of the soil. 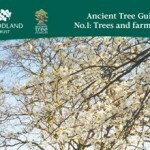 This guide looks at how farming may affect the lives of ancient trees and at simple measures that can prevent their untimely death.